L'EPEE 1839 | 31'080 € Tax inc. The name of the Time Fast D8 clearly conveys its technical aspirations, incorporating a motor that can last 8 days—or rather an in-house caliber with a 192-hour power reserve beating at 18,000 vibrations per hour. With 289 ultra-precise mechanical components finished with the greatest care, Time Fast promises its owner nothing but pure pleasure and sensations. Measuring 38 cm long, 16 cm wide and 12 high and weighing just 4.7 kg, this race car is by no means lacking in stature and could easily have come straight from one of the greatest motorsports stables. For all generations, classic 50s cars are firmly ingrained in the collective subconscious and imagination. Single-seaters boasting a sleek design, fluid lines and assertive aerodynamics, they fuel many a dream. Time Fast, which was designed by Georg Foster while he was a master’s student at ECAL, draws inspiration from a dream of becoming a race driver, or simply the desire to experience the thrills of speed. To create this realistically proportioned mechanical sculpture, he drew on his childhood memories to add symbols and representations, such as boards, bodywork and steering wheels. A fan of motorsport, Georg remembers the typical sound of the smoldering engines and the metallic clicking that follows a mad race, almost echoing the tick-tock of Time Fast D8’s escapement. The shaping and production were entirely entrusted to the manufacture’s passionate teams, predominantly comprised of automotive enthusiasts. With the exception of the raw aluminum casting, the crystals and the jewels, which are sourced from elsewhere, every piece has passed through the hands of the twenty or so experts within the L’Epée 1839 workshops. In motor racing, it's well known that although the driver is the only one to be first over the finish line, his entire team helps to make this victory possible by achieving the impossible. What applies to the track also applies to life as a whole. 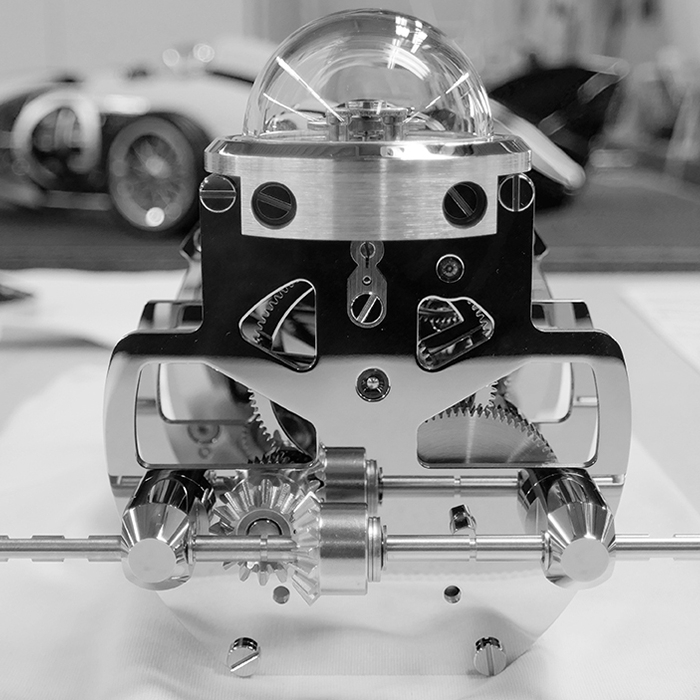 The teams of designers, engineers and watchmakers therefore embraced the challenge of producing an exceptional and unique clock incorporating all the elements of a race car. Every detail has been carefully considered to intimately interlink form and function to spark a renewed fascination for kinetic sculptures. The engine consists of a tiered movement with an 8-day power reserve that was entirely developed to hug the curves of the bodywork. The hours and minutes are displayed on the side through an aperture resembling a typical competition number, via two engraved stainless steel disks. On the other side of the chassis is the advertising spot, the characteristic circle on iconic race cars, which can be optionally customized to create a personalized car, by means of an engraving, for example (the L’Epée 1839 logo comes as standard). In the cockpit, the car’s steering wheel, which has been specially designed to incorporate the time-setting wheel, can be used to adjust the time if theengine ever breaks down. Located in the driver’s seat, a counterclockwise adjustment adjusts the time, while clockwise adjustment can be used to reposition the steering wheel once the correct time is set. Time Fast D8 needs to be filled up (with mechanical energy) once every week. The mechanical movement's barrel is wound by moving the wheels in reverse to provide the car with the power it requires to remain fully functional. Meanwhile drive mode is simply designed to provide unimpeded delight. Just like a normal-sized car, Time Fast D8 is formed of solid aluminum body parts, as well as components as small as an escapement wheel (measuring just a few millimeters across). But here, each part is individually and impeccably finished , whether decorated, polished, satin finished or sand-blasted by hand. L’Epée 1839 presents an interpretation of the car where the human being, symbolized by the escapement, is placed at the heart of the car. Safely installedand protected by a glass dome (the helmet), it sets the pace, just like a driver regulating the power of the engine. The movement’s plates form the chassis. 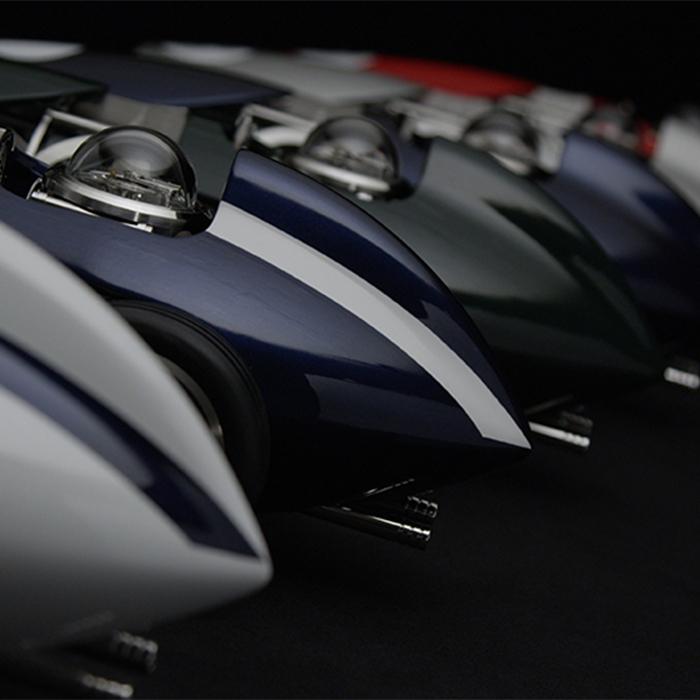 Each has been designed with great attention to detail, symbolizing for instance the engine block of old race cars. As if to cool the motor constantly running at 18,000 vibrations per hour, the radiator grill is openworked to reveal the manufacturer’s emblem. A dual exhaust provides one final nod to the automotive world. Particular attention has been paid to the four wheels, whose spoked rims are wrapped in soft rubber for greater grip, providing excellent transmission of power during winding. A clockwise rotation serves to reposition the steering wheel as desired. Reverse the car to fill it up i.e. wind the barrel, supplying the clock mechanism with energy. The car can move freely forwards. Materials: nickel- and palladium-plated brass, polished stainless steel, colored with the use of automotive lacquers.